The Echo Dot is everything that’s great about the larger Echo speaker condensed into a small puck that costs one-third of the price. The Amazon Echo Dot is essentially all the bits of an Amazon Echo that make it interesting, but without the speaker beneath it – and so it costs just one-third of the price. The Dot is one of three Alexa-enabled products from Amazon that puts the company’s voice assistant front and centre. Only two, the Echo Dot and the Echo are available in the UK: the third, the portable Bluetooth speaker called Amazon Tap, is only available in the US. 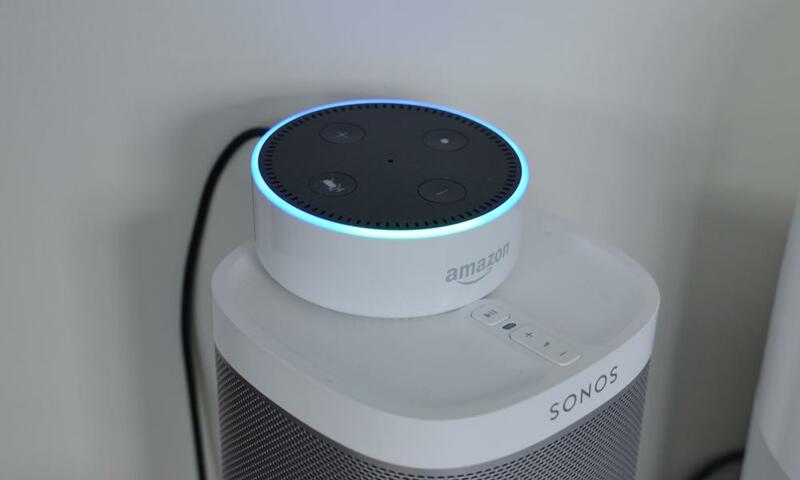 The Dot is a small black or white puck with a ring of lights at the top, four buttons and a seven-microphone array – the same system that makes the Echo speaker so good at hearing you from pretty much anywhere. 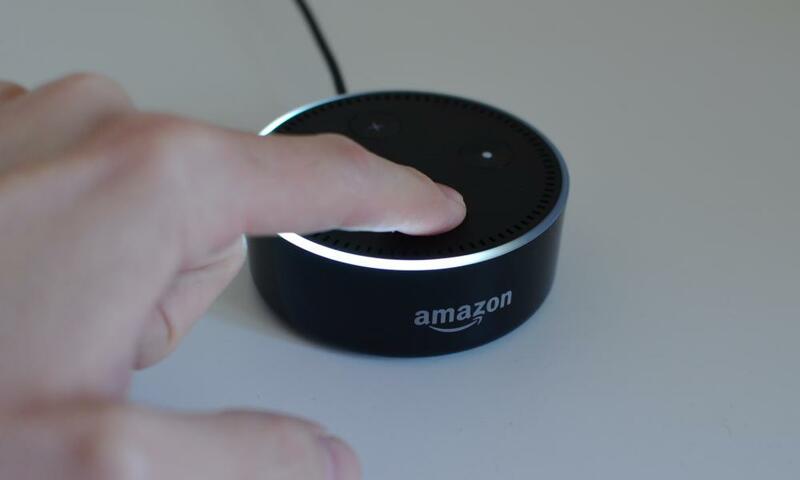 It listens out for a “wake word”, which by default is the name of the voice assistant contained within the Dot: “Alexa”. Say the wake word and the voice assistant comes to life to answer questions, take commands and perform actions. 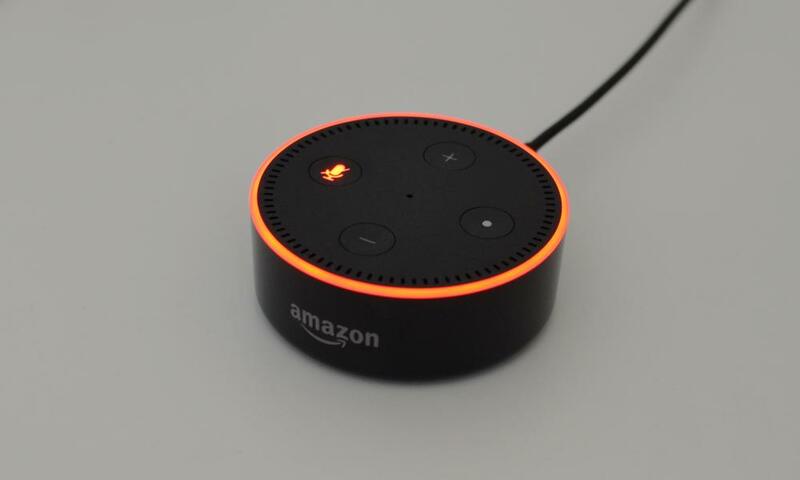 The Dot has a small built-in speaker, which is good enough for all the voice responses Alexa spits out, alarms and other alerts, but is not really designed to play music, producing tinny sound. Instead the back of the Dot has a audio-out port, which is intended plug into your existing speakers. Alternatively, it can pair to a wireless speaker via Bluetooth. The Dot is surprisingly discreet sitting on a countertop or stuck to the wall. There’s a rotating light ring around the top that indicates when it’s actively listening to you and turns red when you hit the mute button, electrically disconnecting the mics, so you know when it is and isn’t listening in. The white Dot has a grey top, which means it stands out more than it might on a white bed-side table, for instance. You can get little jackets for the base in leather or fabric if shiny plastic doesn’t quite cut it with your decor. The Echo Dot can do whatever Alexa can do. 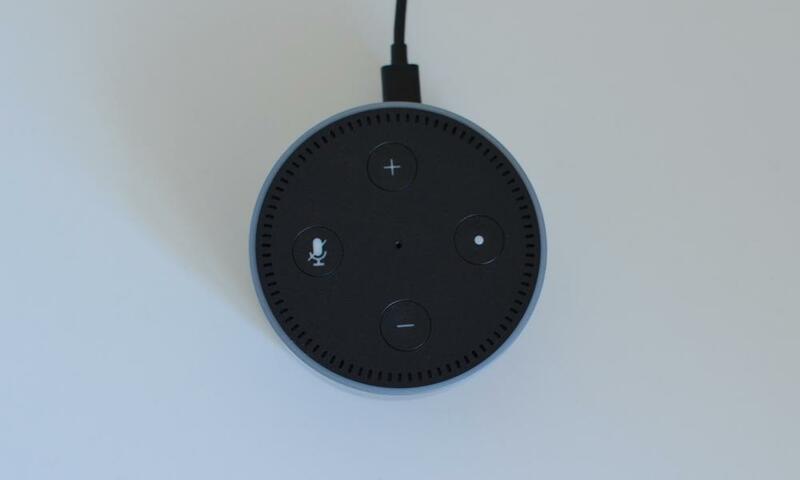 The set up is the same as the Echo: plug it in, open the Alexa app on your smartphone and follow the instructions to connect it to your Wi-Fi network. Once up and running, Alexa can perform a variety of your typical assistant features. It’ll set timers, tell you the time, set alarms, tell you what your day looks like from your connected calendar, tell you about your commute or the weather and answer questions about all sorts of things. Alexa has access to quite a lot of information, but the sheer volume of data Google has at its fingertips, which means Alexa will struggle with certain questions when a Google voice search may not. The big difference is that Alexa replies in a surprisingly human way, and can almost always understand what you’ve said even if it can’t answer the question, which means it should get better over time as more data is shovelled into the backend artificial intelligence. Alexa has so-called skills that can be added to her. These app-like things give her new abilities. Lots of companies and services have skills. The Guardian skill will read you the news, headlines or reviews, for instance. The National Rail skill will tell you what your rail commute looks like. The Allrecipies skill will be able to read you one of 60,000 different recipes. But perhaps the best set of skills available for the Echo Dot are smart home controls. 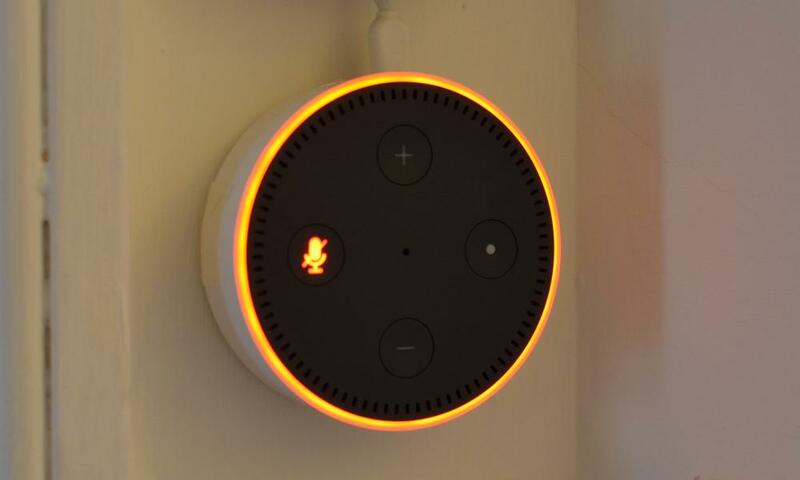 Here is where the Dot shines: it has a wide range of support for smart connected devices, from speakers and remote controls, to lights, coffee machines or anything connected to a Samsung SmartThings hub. Out of the box it works with Philips Hue, while skills exist for Nest, Hive, Honeywell, Tado, LightwaveRF and LIFX, with Sonos expected soon. Once hooked up you can command just about anything. You have to remember the name of the thing you’re trying to command, but within the Alexa app you can group things to turn them on and off with one command. Unlike most other smart home systems, a single item can be placed into multiple groups meaning a bedroom light could be in the “bedroom” group as well as in the “upstairs” group and perhaps a “house” group, so that you can turn just the bedroom lights on, the whole of the upstairs or turn off the whole house when you’re walking out the door. You can also set brightness, colour, scene or anything else your lights support, but lighting is just the start. Almost any smart home appliance can be controlled via voice with the right connection. You can set the temperature via a Nest, set the coffee going via a smartplug, switch the TV on or off, set the channel or do pretty much anything with devices connected to a SmartThings hub. The Echo Dot doesn’t have to be used in isolation either. If you’re in earshot of two Dots or another Echo device, only the nearest one will reply to your commands. Amazon even sells them in packs: buy five get a sixth free, or buy 10 and get two free. Clearly it wants you to put them all over your house. The Amazon Echo Dot costs £50 in either black or white. The larger Echo costs £150. Being able to voice control things without having to pull out a phone or push a button marks a massive step forward for the Internet of Things. Activating, changing, switching things off and firing up automation routines via voice feels natural and satisfying: there’s nothing quite like marching into a room and commanding the lights to turn on. Alexa isn’t quite the all-conquering voice assistant it promises to be just yet, but the Dot gets the job done in a way nothing else can.